Recording Equipment: A brief discussion of audio recording devices, video cameras, microphones, smartphones and computers. Above: Olympus LS-P2 Voice Recorder, An inexpensive but professional quality recorder. Portable and compact. Bluetooth operation allows for wireless connections to phones and speakers. Getting a good recording will be your priority. You can use headsets, microphones or portable recorders. They key is that the device should capture a clear and rich signal. Better equipment will allow for recording at higher bit rates which equals higher recording qualities. There are many options for recording, from built-in mics on smartphones to dedicated audio recording gear like sound cards and microphones. Here’s a quick summary of capabilities of common devices. Microphone – Good quality, if using good product and going direct to sound card. You can buy USB mics that are sold with descriptions such as “desktop” or “podcast” use. Look for an additional XLR connector which is the professional standard. Many micrs made for music recording will work well. 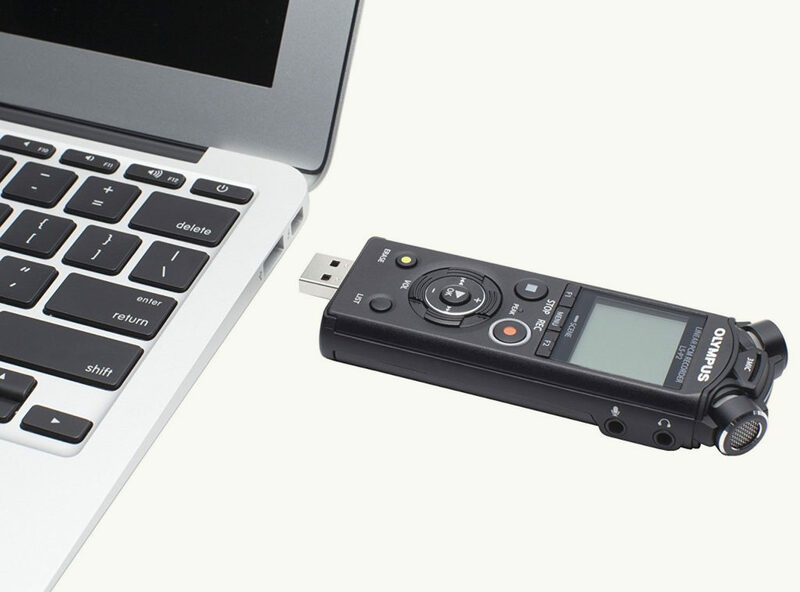 Portable audio recorder – Our current recommendation is to use a portable recorder like those offered by Zoom, Tascam and Olympus. I have been using the H2 by Zoom for many years. It is a fantastic little gizmo that records in pristine super high-quality modes like 24 bit 96 kHz WAV. Smartphone – Generally speaking, terrible audio capture. This is why you can’t solely use a smartphone to shoot a professional movie. A smartphone’s audio is mostly only useful for basic purposes, like capturing an initial brainstorming session. Laptop – Medium quality capture. I tested voice recording with my Macbook Pro Retina 13” and it sounded terrific. However my guess is that the average laptop is mediocre at audio capture. Skype is fine but you wouldn’t normally record for important media projects with any built-in computer mics. My suggestion is that the portable recorder or desktop USB microphone would work best for most educational recording scenarios. I’d go ahead and buy the Olympus LS-P2 if I had a budget in the $200 range. Watch the video on using the Olympus recorder and answer the questions. What recording quality settings does Ramon use? Why? Would you record your session differently?